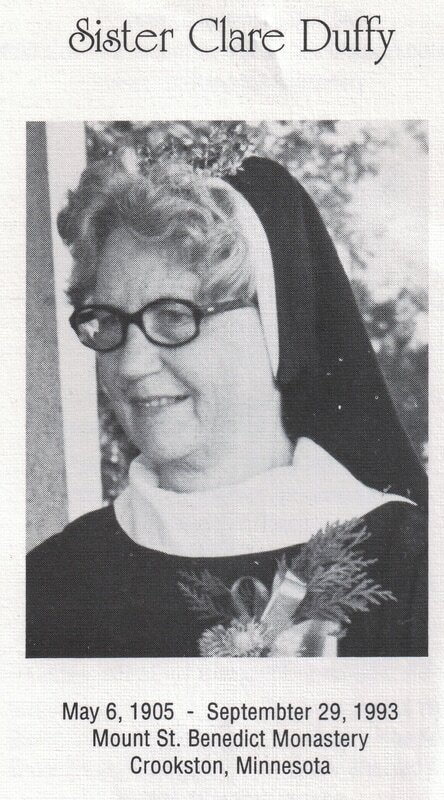 Sister Clare (Mary Elizabeth Ann Duffy) was born in East Grand Forks on May 6, 1905. She was the third of the seven children (Four sons and three daughters) born to Edward and Amelia Jeffry Duffy, both natives of Ontario, Canada. Mary attended Sacred Heart School in East Grand Forks until her senior year, which she finished at Mount Benedict Academy in Crookston. 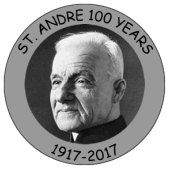 She entered religious like at Mount St. Benedict on February 10, 1923, and pronounced her final vows in 1927. Sister Clare was the first sister-chauffeur in the community at Mount St. Benedict. As such she was closely associated with the first prioress, Mother Eustacia Beyenka,during the early years at the Mount and always cherished the memories of working with her in bee culture and the sale of honey products. She served as prefect of novices from 1933 -1937. Sister Clare took her college work at Valley City State College, the University of North Dakota in Grand Forks, as well as at the State Universities in Moorhead and bemidji, and at St. Catherine's College in St. Paul. She taught in the parochial schools of Crookston, Moorhead, Thief River Falls, Red Lake Falls, Mahnomen, Mahtomedi, East Grand Forks, and Benson from 1925 - 1972. She was chosen as Teacher of the Year in Moorhead in 1946 and was awarded the George Washington-Valley Forge medal in 1964 when she was teaching in Red Lake Falls. Sister Clare's most outstanding work was her ministry to Hispanic migrants, covering a span of over 35 years, from 1942 - 1978. She opened the summer boarding schools for Hispanic children in Moorhead in 1943, and in Crookston in 1953. She was active in the summer educational programs in these parishes until the government began to provide for the education of the migrant farm-workers in 1964. She supervised the summer religious educational program for the Hispanic children from 1972 - 1978. Sister Clare continued to enjoy close friendships among the Hispanic people even after ill health forced her to retire in June 1985, when she became a resident in Mount St. Benedict Health Care Center. She died there unexpectedly on Wednesday, September 29, 1993.